﻿Before analyzing literature, there are terms students need to know. Many of these words apply to fiction literature. However, some cross over to nonfiction. Below are copies of our literary vocabulary notes. Use All Literary Terms on Quizlet as a study tool to prepare for Quizlet.Live classroom competitions. My handouts are free to use for nonprofit classroom use only. You do not have the rights to use them for profit. deconstruct means to take apart. Students can study the 20 Most Common Prefixes on ﻿Quizlet﻿ to help them prepare for the Quizlet.Live classroom competitions. 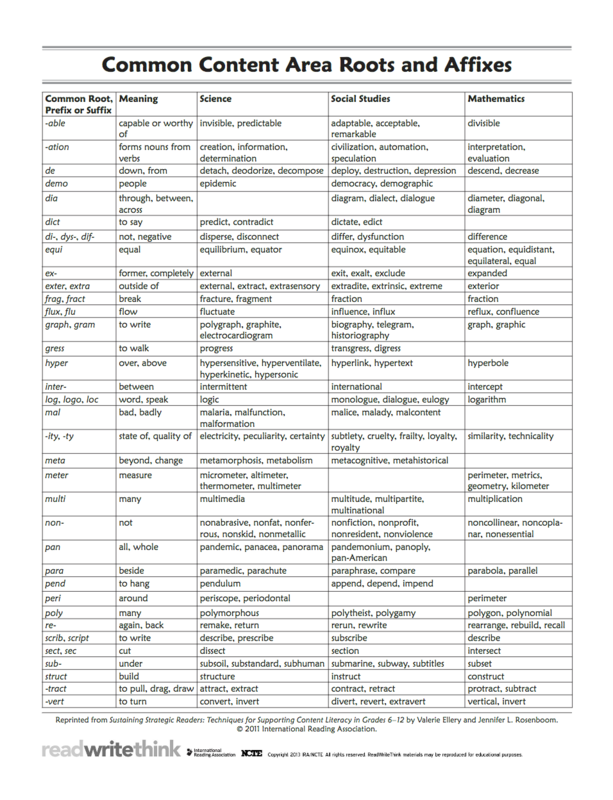 Download Most Common Prefixes / Most Common Suffixes at Scholastic. Suffixes are groups of letters added to the end of words. Some suffixes add meaning. For example, adding -less to the word help creates antonyms: help and helpless. Others synonyms change the form of a word, the part of speech. For example, adding -tion to construct turns the verb into a noun: construction, the process of building something. Greek and Latin roots are key because students can unlock many unfamiliar words by learning one root word. Common Content Area Roots and Affixes (Read, Write, Think) is list of root words that transcend Science, Social Studies, and Mathematics. Student quickly learn the value of root words when they pop up in all subject areas. Download The Top Ten Greek Root Words You Need to Know and The Top Ten Latin Roots You Need to Know posters from the Prestwick House English Teacher's Free Library. Sharing these with students will expand students' vocabulary exponentially.